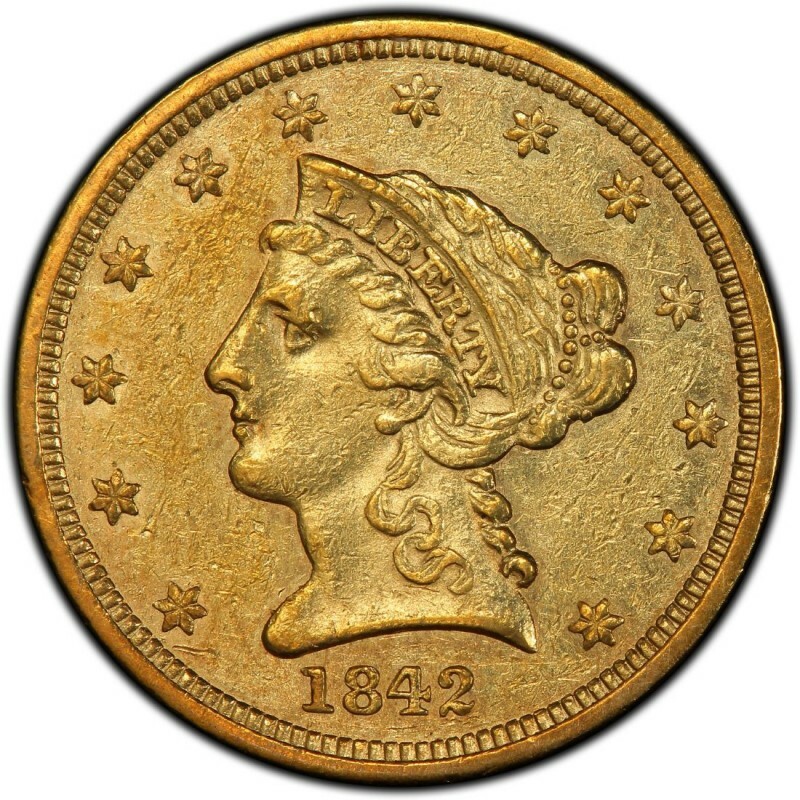 1842 Liberty Head $2.50 gold coins were produced at four minting facilities throughout the United States, including mints in Philadelphia, Charlotte, Dahlonega, and New Orleans. 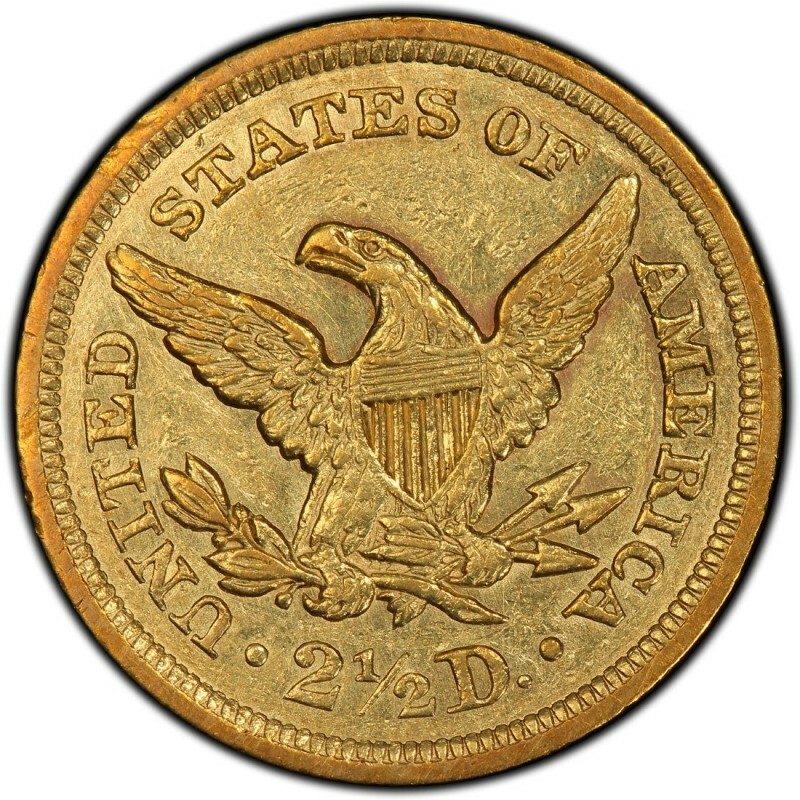 Most 1842 Liberty Head quarter eagles are scarce, with the exception of the 1842-O Liberty Head $2.50 gold coin. Though, it must be noted that all Liberty Head gold coins, and, in fact, all pre-1933 U.S. gold coins, are considered relatively scarce. 1842 Liberty Head quarter eagles are produced from a composition consisting of 90 percent gold and 10 percent copper, which is otherwise regarded as a standard “coin gold” metallic composition for gold coinage of the era. 1842 Liberty Head $2.50 gold coins weigh 4.18 grams and feature a physical diameter meausring 18 millimeters in width. That is just 0.1 millimeter wider than a standard dime. In all, 1842 Liberty Head $2.50 gold coins contain a total of 0.1202 ounces of gold. 1842 Liberty Head $2.50 quarter eagles, also known as Coronet Head type quarter eagles, were designed by Christian Gobrecht. Gobrecht served as Chief Engraver of the United States Mint during 1840 through 1844 and designed the widely popular Seated Liberty coins struck from the 1830s through the early 1890s.